This third of five interviews with top U.S. cyclocross course builders features the man behind this weekend’s Charm City Cross in Baltimore, Md. Jay Lazar is a Baltimore resident, a masters racer and the chief designer of the parcours, which first received UCI C1 status in 2016. He spoke with soon-to-be Belgium-based professional cross racer Andrew Juiliano for this feature, which first appeared in abridged form in ROAD Magazine. Tell me a bit about your day job. What is a hydrographer? My background is in nautical charting and sea-floor mapping. Basically, it’s going out in a boat using sonar, GPS, and other sensors to collect seabed data. I apply it in a habitat sense. I do native oyster restoration work. I’m a hydrographer by training, and I coordinate our offsite program in the Annapolis [Maryland] area and the Chesapeake Bay. I went to school at N.C. State and did a marine resource management program. Instead of going onto graduate school, I got an opportunity to work for NOAA [National Oceanic and Atmospheric Administration] up in Alaska doing nautical charting. That got the ball moving in 1997. I never really looked back from there. One good opportunity opened up after another. Is there any crossover between seafloor charting and building cyclocross courses? It’s kind of funny. In a way there is because you need a good understanding of the terrain for both. We design restoration projects for oysters in the bay, and a big part of that is having an understanding of the terrain that you have, where things have historically worked and where they haven’t, taking into account the flow of water over a particular feature. I’ve never really thought about it, but in a way there is a huge amount of crossover. What is your background in cycling and course design? Cycling background started with BMX in the mid-’80s, recreational mountain biking since the mid-’90s, triathlon in the mid-2000s, and cyclocross since 2008. How many courses have you designed and built? In 2011, I offered up some ideas and took over the course building at Charm City. I’ve been completely responsible for building Charm City since then, and I played an advisory role on another, Milkhouse CX, which was a one-time race. First, I get as familiar with the terrain’s major and subtle features as I can. Then, I sketch. I sketch out options for everything. I look at where the start and finish might be as well as how the course and features will flow. When I’m laying everything out, one of the biggest things for me is how to make it really successful for the spectators that are there, and not just the spectators that would come to the course anyway, but the general fans who live in Baltimore. We try to be thoughtful about how to make it as good as possible for both the spectators and the racers. The entire race team [C3-Twenty20 Cycling] comes together a few days before the event, and that’s when a lot of the magic actually happens. We have a general concept and a general design, but we think about how we want to do it different each year, and how we want to take advantage of subtle features. Kris Auer [former course designer and the promoter for Charm City] has continued to have a huge hand in final preparations. We’ve been really fortunate over the past several years to have Stef Wyman, Helen Wyman’s husband, out participating in the race. He’s also out there with us, getting in the trenches helping us out. I’m so new to this, but guys are willing to throw down some ideas and spend the time to make the course what it is. Those are opportunities for me to learn from. Every year, we get together and try to figure out a way to make it fresh. 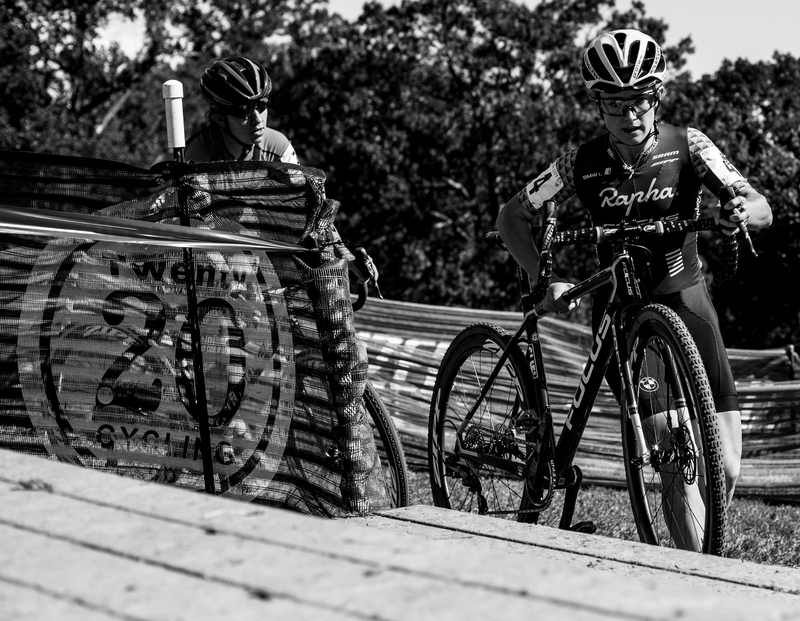 What makes a good cyclocross course? It starts with a good variety of terrain and then the thoughtful use of both obstacles and features using that terrain. The Mid-Atlantic rarely sees good “cyclocross” weather, but a course should be designed around that day the weather works out to be wet. What is the defining feature of the Charm City course? The Charm City course has evolved over the years, but recent versions have been defined by the use of the Mansion House climb and series of large stairs. I pushed to expand the course onto that Mansion Hill section [feature photo] to really open it up and give it a more spectator-friendly atmosphere. That section also added a high point of elevation that everyone had to get up. Before we switched over to the Mansion House field, there was much less variety of terrain and it was very twisty through the oaks and lower fields. It moved the start to the other side of the park. It opened up the opportunity to take it up to that high point on the hill and to use that elevation so it just didn’t feel gratuitous. You can have a bunch of terrain and features, but some races don’t use those features thoughtfully. Ellen Noble leads Emma White up a series of stairs at Charm City Cross 2016. What is your favorite domestic course? Domestically, Asheville Nationals  had it all. They really set the bar where it should be for cyclocross in the U.S. I really liked the way it flowed. I felt like it crisscrossed the park — it came back and forth on itself. I liked the incorporation of the big hill run-up and the multiple run-ups, the fact you were forced off your bike multiple times. I don’t think anyone could ride that entire course. There was a lot of thought put into the amazing features that were there. I loved the cow pasture that dropped down through the wooded section. That was hard. You don’t see a lot of that in most courses. It was a fun course. I really enjoyed racing it and thinking about what they did. What is your favorite international course? When I’m on a trainer, I try to watch as many European races as I can, and there are so many features that I’ll look at and think, “Oh, we could do that at Charm City.” There’s this one hill in Baltimore that you go up and down several times [in succession] by the team tents, and that’s something that I pulled from Ruddervoorde. I liked how they had a handful of features on that course and I thought they used them really well. I love a lot of the big-terrain courses. I love Namur and the citadel. To have that kind of a venue to host a race, and the kind of features that they have there—I hope to get over there and watch one of those races one time. Those are two totally different courses, but they both stand out for me for different reasons. Do you race? If so, how does that influence your course design? I do, mostly in the Mid-Atlantic region. I approach racing different venues as an opportunity to learn what other course designers are doing well, and I think about how to incorporate that thoughtfulness back into Charm City or any other course I may have a hand in designing. I feel like people who use off-camber really well have influenced some of the design at Charm City. Whenever I’m at a race and they’ve put in a really thoughtful feature or used some subtle terrain in a way that can especially be a game changer in a race, that’s the kind of thing that I try to pay attention to. I think about where I have something similar to add a particular feature like that [in Baltimore]. Are there any unique regional considerations when designing the course? As I mentioned, the Mid-Atlantic region is pretty dry. I try to think about maintaining good flow without having the race be all about pedaling. Breaking up the race with more off-the-bike time is not used enough, in my humble opinion. Are courses challenging enough in the U.S.? For me I’d say mostly no. There are exceptions but most courses are dumbed-down for the beginner and youth racers to the detriment of the development of those racers and the sport in the U.S.
An exception that comes to mind is in our local Super Eight race series [now Bikereg Super Series], Capital ‘Cross Classic. It has great terrain. The course designer and promoter, Bruce Buckley, puts a lot of thought into keeping it fresh and making it challenging. It’s a hard course, but it’s a fun course too. Admittedly, my sample size is not so big since I don’t get out much and travel around the country. There are courses that you hear about that are hard, like [Jingle Cross in] Iowa. I hope to get out and see that. I think that Louisville at Worlds in Eva Bandman Park, it looked hard, and hard in a really fun way. That was one that I did get to see, but I didn’t get to ride. What are your thoughts on pro-only sections? They’re mixed. If more courses were more challenging then they wouldn’t be needed. Mostly, I say this as a masters racer who will ride anything that a pro will ride. That said, we have too many easy courses and therefore, pro-only sections have a place. What was your goal when you designed the Charm City Course? Personally I thought Charm City was one of the hardest courses I raced this past year, not so much technically but just physically. It was brutal with the mix of elevation on the Mansion Hill and all the punchy climbs. We don’t have the technical stuff and that’s part of the reason why that course has been so hard. I’m glad you said that. I don’t know whether or not it needs to be kept the way it is. I know it’s hard. There are times where it’s been one of the hardest races that I’ve done throughout the year. It is hard. Because we don’t have some of those defining technical features, we do want it to be hard. At the same time, I would feel terrible if people came away from it thinking it was just a pedaler’s course. I want to build a driver’s course. You need to have the technical ability to still ride your bike and go fast. I never have really heard that [about Charm City]. I often hear from people that Charm City was one of the hardest courses they did all year, and it was a lot of fun: “It hurt in a way that I loved.” That Ruddervoorde section can be tough [both technically and physically]. It’s hard pedaling but you still have to be thoughtful about steering at the bottom of each descent/climb since the turns are on the off cambers. Fun and hard are synonymous sometimes, but as long as that combination happens, I feel like we’ve done our job. Great interview about a great course!